Mastering Architecture: Oracle & BEA: A Match Made in Heaven? Today Charles Phillips and Thomas Kurian disclosed Oracle's strategy concerning the integration of BEA and Oracle. Lots of changes, though most are not surprising. Oracle's vision towards SOA has been clear for the last few years, and I look upon this merger as one of the highlights. I am surprised that there's relatively little overlap between BEA and Oracle's offering. In fact, it is an example of realworld synergy, leading to a best-of-breed SOA technology stack. In that sense I fully agree with the closing words of Thomas Kurian:this is the best middleware suite in the industry. So, the answer is yes: it's a Match Made in Heaven! Not surprisingly, Oracle has integrated WebLogic into both JDeveloper and the Application Server, replacing OC4J. This will be good for performance and stability. But, it gets better. 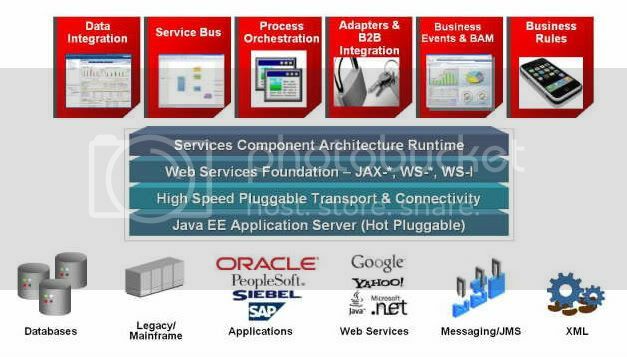 Oracle has announced Oracle Service Bus, in fact replacing ESB with AquaLogic Servicebus (ALSB). Customers will have several years to decide to stay on current installation of ESB or ALSB, and migrating later. JRockit, the world's leading VM will be the standard VM for Oracle, Coherence will be the central component for dehydration. So we get zero latency in the VM and unparallelled performance for the dehydration store. I feel like I'm in a candy store! Thomas presented a roadmap towards Oracle Service Bus. This does not mean that the ESB and the Aqualogic Service Bus are discontinued, but they will converge towards the OSB. No forced migration here, but the OSB will consist of the strong points of both ESB and AL-SB. Another interesting development is the integration of BPM Studio into the BPA Suite. It's fair to state that the Oracle BPA Suite, in conjunction with the Oracle SOA Suite (BPEL PM in particular) is the world's best-of-breed for procesmanagement, -design and execution. The added functionality from BPM Studio will create a comprehensive set of tools to support both process architecture, design and execution in a fully supported roundtrip engineering environment. This will also mean that from the new version onward, XPDL will be supported. Integrating all the tools will take some time, but in the end we will have the BPA Suite for architectures and high level proces modeling, the BPM Suite for building processes in XPDL/BPMN and BPEL to execute them. The roundtrip engineering will be between BPM Suite and BPEL. Oracle aims to deliver a web-based Proces Designer, although the details about this are not yet fully clear. So, when will 11g be available? Well, JDeveloper 11g will probably go GA towards the end of the year (might even be launched during OOW 2008). Fusion Middleware will take some longer, due to the ongoing integration. I think it's worth waiting for. The newly added components JRockit, Coherence and BPM Studio will make the whole Suite a lot better. Besides, it also gives Oracle time to finish WebCenter and WebCenter Spaces, products that will revolutionize the way we build web apps. And the winner is ....... JDeveloper. Yes, JDeveloper will continue to be the central IDE for Oracle. All the components in the stack will have a plugin in JDeveloper to increase production and quality. Of course, Eclipse will still be supported, but not for BPA and BPEL. If you want to read more about Oracle's strategy, go to http:www.oracle.com/goto/july1. The webcast will be made available soon too.